Capital of the province of Quebec; situated on the left bank of the River St. Lawrence. The first Jew known to have resided in Quebec was Abraham Jacob Franks, who settled there in 1767. His son David Salesby (or Salisbury) Franks, who afterward became head of the Montreal Jewish community and an officer in the American Revolutionary army, also lived in Quebec prior to 1774. Abraham Joseph, who was long a prominent figure in public affairs in Quebec, took up his residence there shortly after his father's death in 1832. Quebec's Jewish population for many years remained very small, and early efforts at organization were fitful and shortlived. 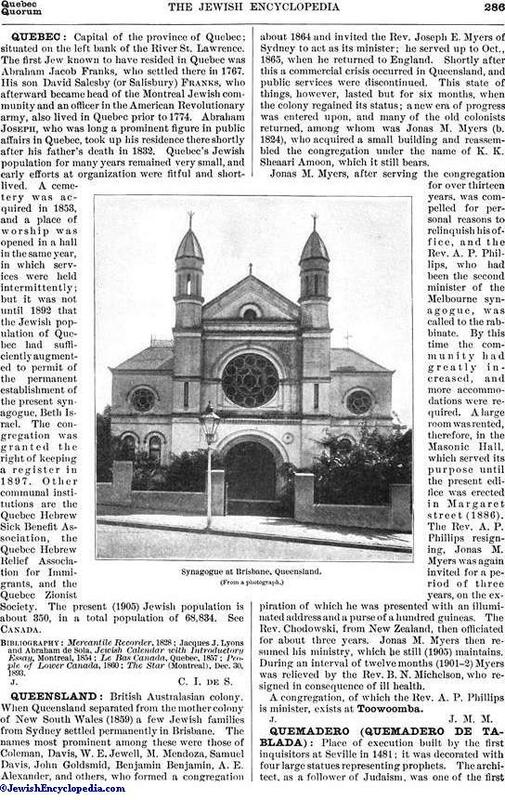 A cemetery was acquired in 1853, and a place of worship was opened in a hall in the same year, in which services were held intermittently; but it was not until 1892 that the Jewish population of Quebec had sufficiently augmented to permit of the permanent establishment of the present synagogue, Beth Israel. The congregation was granted the right of keeping a register in 1897. Other communal institutions are the Quebec Hebrew Sick Benefit Association, the Quebec Hebrew Relief Association for Immigrants, and the Quebec Zionist Society. The present (1905) Jewish population is about 350, in a total population of 68,834. See Canada. The Star (Montreal), Dec. 30, 1893.